Costly gym memberships, personal trainer fees, and expensive equipments at the gym that we cannot have at home- all these factors make our dream of building muscles and keeping fit at a high cost almost impossible to achieve. But you can save your hard-earned money and continue doing workouts using your own body weight, outdoor props or items you already have around the house! Plan your workouts. This means sticking to a schedule. Set a specific time for your workout, and limit distractions by turning off the phone, making sure the dog is walked before you start, and, if possible, letting family members know that for 30 minutes or so, they are on their own. Go for home workouts. Your program has to include 30 to 60 minutes of moderate to vigorous aerobic exercise three to five times a week at home. Squats, partial body pushups, modified jumping jacks, chair crunches, and chair dips are some of the workouts you can do at home. Turn your house equipment into gym equipment. If you think out of the box, you will be surprised at how normal props at home can be substituted as fitness equipment. Use soup cans/jugs for weights, substitute paper plates for body sculpting equipment, use countertops for push-up benches, and your tights for resistance bands. Use your computer for motivation and help. You can find exercise-tracking tools and spreadsheets on a number of websites. Use them to create and maintain a training regimen, keep track of your progress, and even share online with friends, family members, and fellow exercisers. Take a TV exercise break. Pick a different activity for each commercial and do it till the show comes back on. The longer you watch TV, the more exercise you'll get. Spend little, get a lot. 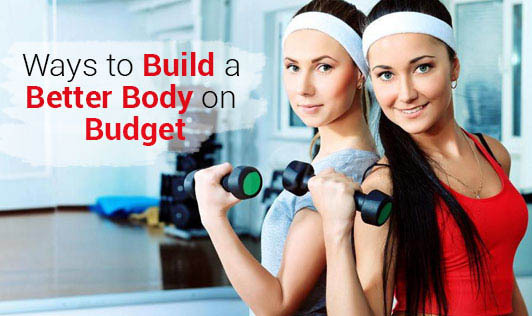 If you have some money to spare on body building, fitness equipments like dumbbell sets, kettle bells, stability balls, step benches, and instructional DVD’s may benefit you. Follow a healthy diet consisting of lean proteins and complex carbohydrates including starchy and non-starchy vegetables as well as healthy fats in moderation. They can help you gain lean muscle without having to spend on protein supplements. Take advantage of the great outdoors and save money by moving your workout routine to a park, playground, or stadium. Use park benches to do triceps dips, push-ups, and V sit-ups. Try the monkey bars for chin-ups.